Napheesa Collier makes a run for the basket. Stephen Slade photo. Connecticut is in a slump. It shows in many subtle ways, but the most obvious is that they are not shooting well, either individually or as a team. A team that shot 53.3 percent last season has slipped to .489 this year. In their last six games, they have shot just .481. Some may have been surprised, but few were shocked, when Baylor defeated the Huskies in Waco two weeks ago. The Bears are a very talented team, and their guards stepped up their play in the biggest challenge of their season. But UConn shot just 11-32 from beyond the arc in that game. Katie Lou Samuelson – who once shot 10-10 in a game, was 2-10 from beyond the arc against Baylor, with most of them open looks. Since that game, the Huskies have played six teams from the weak American Athletic Conference, and have looked only like the best team in a very middling mid-major conference – not like the No. 3 team in the country, their current ranking. Last season, UConn defeated AAC opponents by an average of 53.5 points a game. In the six conference games this year, the margin is 30.6. What is more, because the games are not early blowouts, the starters have played far more minutes this season. One of the best three-point shooting teams all last year (.400) now has a team average of a more ordinary .357. Samuelson, the best outside shooter in the nation last season (.475), is 17-54 (.314) in the last seven games (including Baylor), and now has a season average of .373. Freshman Christyn Williams, who everyone was anointing Freshman of the Year after her dominating performance against Notre Dame earlier in the year, looks completely lost. Against lesser conference foes, she is 20-51 (.392) in the last six games, and 2-18 (.111) in three games during mid-January. She recovered against SMU this week by shooting 5-10. So, what’s going on here? Probably only a psychologist could tell. 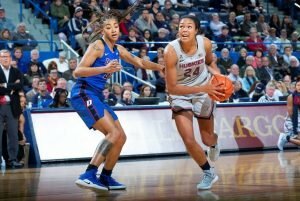 Coach Geno Auriemma has said, “We just have a very immature team right now.” Junior point guard Crystal Dangerfield, who broke out of her own shooting slump against Temple on Saturday, echoed exactly that sentiment after a recent game. As a long-time observer of UConn, there are a few key points I have noticed. First, the Huskies are losing the effort-battles. They have been hammered by offensive rebounds, and they seem to lose most other hustle plays. Secondly, players are no longer diving on the floor after loose balls, which is usually a Husky norm. Thirdly, the offense – long known for its movement and passing – often looks stagnant. The slump is also is reflected in two less commonly-noted statistics. While UConn’s assist per basket is a commendable .606, even that is down from last season’s .653. Their assist/turnover ratio is also down, from 1.9 to 1.6. Fourth, the team just doesn’t look like they are having fun. Napheesa Collier has been largely immune from the shooting slump (except from three), but she rarely smiles on the court these days. Samuelson, who usually seems joyful on the court, is glum. That team, of course, went undefeated in the regular season and reached the Final Four. Perhaps this team is just distracted, too. Perhaps a return home; a return to the routine of classes; to more regular practice times; will refocus them quickly. The Huskies are just in a team funk offensively. [Ironically, their defense – criticized all season by Auriemma – seems to have been improving lately.] They probably can pull out of it. It’s hard to believe that Samuelson, one of the best shooters in the game, will continue to spiral downwards. But right now, UConn is not playing like they have traditionally, and if they continue on this route, they will not beat No. 2 Louisville Jan. 31. They might struggle against, or even lose to, a very good UCF team Jan. 27. Come March? Auriemma has made his reputation in part on his ability to get his teams playing like teams by season’s end. The Huskies have made eleven consecutive Final Fours. It may be less likely with this team than with some of those previous eleven. But there’s no real reason to think it is out of the question. What more needs to be said?